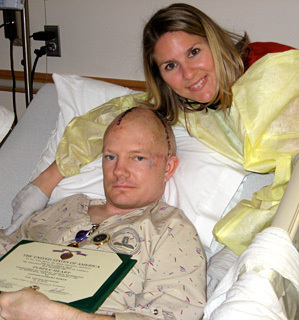 In the current wars in Iraq and Afghanistan the “signature wound” is traumatic brain injury (TBI), of which epilepsy is a common long-term consequence. Those who suffer severe head traumas face up to a 50 percent chance of developing post-traumatic epilepsy, and frequently, this chronic condition does not respond to available treatments, imposing significant ill effects on rehabilitation and quality of life. The civilian population is also at risk; TBI accounts for 5% of epilepsy. civilian and non-civilian populations, there is still a lack of research focused on this area. Post-traumatic seizures can develop at anytime after the injury—from within one week to fifteen years later. At this time, there is no way to prevent or cure post traumatic epilepsy. Now in its third year, CURE’s program, Prevention of Epilepsy after Traumatic Brain Injury, targets funds to basic and applied research on epilepsy related to traumatic brain injury impacting combat, veteran, and civilian populations in order to better understand the causes of epilepsy following TBI and develop interventions and treatments. This program is in partnership with the United States Army Medical Research and Materiel Command (USAMRMC). The program is financed by the USAMRMC, and administered by CURE. This program supports investigator-initiated research of relevance to the prevention and treatment of post-traumatic epilepsy, including the cellular, molecular, and systems-level understanding of the underlying pathogenic mechanisms; specific approaches to interdict the development of post-traumatic epilepsy; animal models of post-traumatic epilepsy; and investigations of the impact, natural history and epidemiology of post-traumatic epilepsy. CURE is embarking on its final year of partnership with the USAMRMC for this program. However, CURE is dedicated to continuing support for research in this critical area. With relatively little investment compared to what it deserves, this targeted program has already produced significant results, including a recent exciting breakthrough from Daniela Kaufer, PhD (University of California, Berkeley) and Alon Friedman, MD, PhD (Ben-Gurion University of the Negev, Israel). Drs. Kaufer and Friedman have discovered that drugs known as TGF-beta blockers prevent epilepsy after brain injury in rats. They found that they could prevent the brain changes leading to epilepsy by treating the animals with a drug that blocks transforming growth factor-beta (TGF-beta) receptors. If the findings are confirmed in humans, the TGF-beta blockers may prevent many cases of epilepsy in accident victims and soldiers serving in Iraq and Afghanistan. Only with increased public and private funding for post-traumatic epilepsy can researchers continue to explore new areas that will one day lead to prevention and cures for epilepsy.